At 20 credits each (from €9, depending on how you buy credits) this has something to appeal to a variety of players for the price of a few pints. Nice variety of new models to try out. It could get quite expensive if you wanted to purchase all of the add-ons. 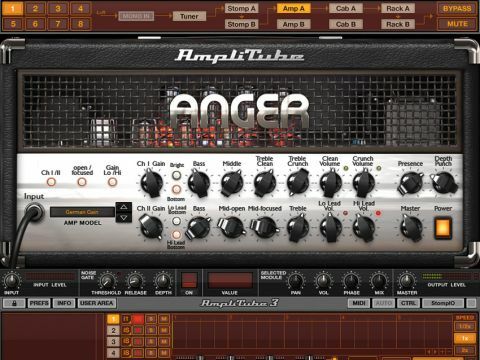 IK Multimedia continually expands AmpliTube 3 and has just released version 3.7 for free download. Each upgrade may include bug fixes or add new features for all users (3.7 adds OS X Lion compatibility among others) but a big part of it is to add models that you can try out and perhaps purchase from the Custom Shop. This time there are four new amps, one cab and two microphones. Jet City is the latest company to license models for AmpliTube, offering the JCA20H and JCA100H, both with a nice line in Soldano-designed overdrive. For metallers the German Gain model is based on the Engl Fireball and has a massive array of controls that can conjure up powerful leads as well as heavy rhythms. IK has also filled a gap in its vintage Brit kit list with the HiAmp, based on the HiWatt DR103. Finally, a couple of high-end valve condensers (modelled on the Neumann CMV563 and Brauner VM1) bring a touch of class to the selection, offering more options for tailoring your end sound if you feel the need.